Imagine a transport vehicle that could avoid those heavy traffic, wouldn't life be easier? Well imagine no more! 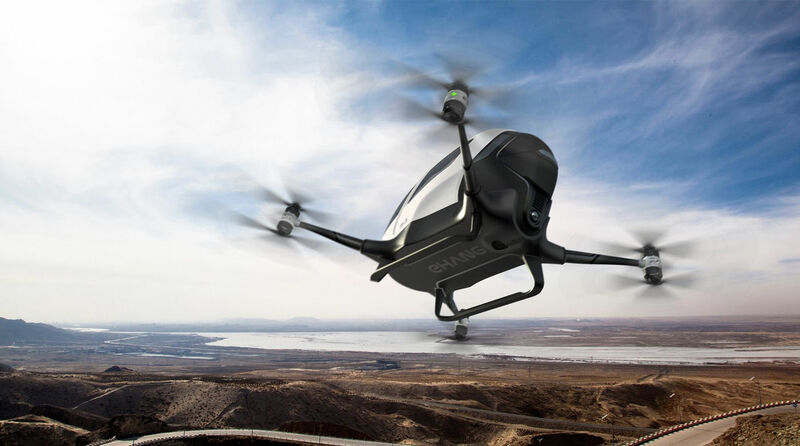 The Chinese company Ehang made life easier for they built a drone that has 4 arms and 8 propellers designed to carry a 220-pound load flying under 650 feet in the air. It could cruise for 23 mins at an average speed of 62 mph. It takes two to four hours to charge the drone. It uses an application that could take off and land you to your desired destination. You just need to enter your desired destination and let the drone navigate you to your destination. It has a real time data collected from sensors throughout the flight and automatically plot the fastest and safest route to carry you to your destination. It has a safety feature that could ensure your safety while flying to your desired destination for it has a built in reinforcement for flight system that could avoid unlikely events such as crashing. In case the drone malfunctioned or damaged while the AAV is in flight the aircraft will immediately begin taking necessary precautions to ensure safety. Want to know more about this awesome device? Follow this Link!